Union Minister for Chemicals & Fertilizers and Parliamentary Affairs, Shri Ananthkumar briefed the media on the outcome of the 18th meeting of the GST Council, held here on 30th June 2017, regarding Fertilizer sector. The Minister said that it was decided to reduce the GST rate of fertilizers from the existing 12% to 5%. This decision was primarily taken in the interests of the farmers. The Government has also taken up with the Industry to pass on the benefit to the Farmers, the Minister informed. Shri Ananthkumar said that farmers would benefit to the tune of Rs. 1261 crores under GST regime. Under the new GST rates announced by the Council, average weighted MRP will decrease to Rs. 5909/ Ton (or Rs. 295.47/ 50kg bag) as compared to the existing All India weighted Average of Rs 5923/ Ton (or Rs. 296.18/50 kg bag). Consequent to the ushering in of the GST regime, Shri Ananthkumar informed, there will be a uniform MRP of Rs.295.47 per 50 kg bag across the country except couple of States where additional VAT is charged on the natural gas as Natural gas has not been brought within the ambit of GST. However, even in these States, MRP will reduce by Rs 3 per 50 kg bag. 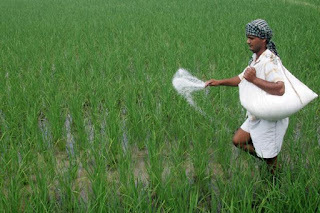 Similarly, MRP of P&K Fertilisers, for which the prices are not administered, are also expected to come down on an average basis as the incidence of tax will be lower than the existing tax on an average, the Minister added. The GST regime, apart from integrating the entire fertilizer market into a single market, will also deter inter-state smuggling of fertilizers which may be currently happening due to differing levels of taxes and consequently MRPs in different adjoining States. The GST would realize the Prime Minister of India, Shri Narendra Modi's vision of 'One Nation, One Market, One Tax', Shri Ananthkumar said.